Sometimes, you need more power. And to get that power, you need to plug in -- batteries just aren't going to cut it. If you've got to drill holes in metal, wood or masonry and you're looking for the right tool, you need the best corded drill for the job. We've rounded up our top five picks. Read on to learn more about what to look for in a corded drill and what makes this tool one of the best on the market. When looking for the best corded drill, we kept a few things in mind. We paid attention to the power of the drill as well as to the quality of the chuck. While most of our picks had around 7.0 amps, our top pick, the DeWalt Pistol-Grip drill had an 8.0-amp motor. 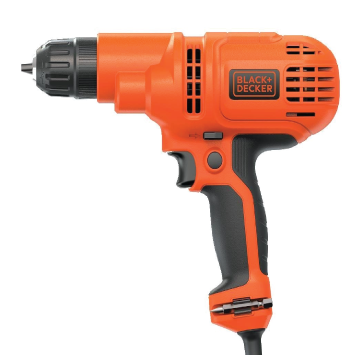 The weakest drill in our roundup, from Black+Decker, had a motor with just 5.2 amps. That’s enough for a few household projects but won’t cut the muster if you’ve got a lot of DIY ideas on your plate. Most of the chucks on the drills we looked at were keyless, meaning you can tighten and loosen them to replace drill bits by hand. Only the SKIL had a keyed chuck, which worked against it. Finally, we took a look at comfort and ease of use. Most of our picks are lightweight, though some, such as the Black+Decker are better balanced than others (such as the DeWalt). The DeWalt corded drill has an 8.0 amp motor, which is just the right amount of power for most home and DIY projects. It also has a 3/8-inch all-metal ratcheting chuck that’s keyless, making it easy work to swap drill bits in and out (make sure you pick the right size drill bits!). The DeWalt corded power drill was made with comfort in mind. It weighs just over 4 pounds and has a comfort grip handle. There’s no side handle, but the drill is lightweight enough that you don’t need one. People who’ve used the DeWalt drill have called it awesome and have said that it’s the best drill they’ve ever owned. Although some have complained that they think the drill’s trigger is too sensitive, others claim that it’s just right. 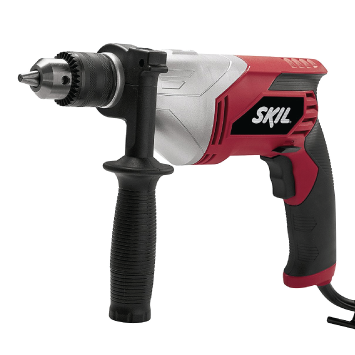 The SKIL corded drill has a 7.0-amp motor, so it’s just slightly less powerful than the DeWalt. That doesn’t stop people who’ve given it a whirl from praising its power, though. Some people have expressed surprise at just how powerful the drill is, noting that they were expecting less from it. The SKIL corded drill has a 1/2-inch keyed chuck, which is both good and bad news. The good news is that the chuck can handle drill bits up to 1/2 inch. The bad news is that the key can be tricky. It’s not attached to the drill in a convenient spot, and it can be easy to misplace. Two significant features on the drill are the side handle, which helps you to hold the tool steady as you work on larger projects and the variable speed trigger. The trigger is a two-finger model that has a lock option. While the majority of people who’ve used the drill are happy with its performance, not everyone is delighted with it. Some complained that it was too underpowered for their projects (such as drilling into concrete). Others stressed that the drill is a good pick for light jobs or infrequent use. If you’re going to be drilling every day, they recommend picking a more powerful model. 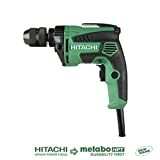 Another 7.0 amp model, the Hitachi corded drill has a 3/8 inch keyless metal chuck. If you want super hold and grip without the need for fumbling with a tiny key, a keyless chuck drill is the way to go. 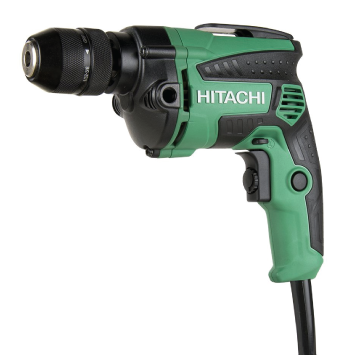 The Hitachi also offers a variable speed trigger that has a lock-on feature. If you’ve got a lot to drill, using the lock feature on the trigger helps to improve comfort and reduce the risk of your hand getting tired. The handle of the corded drill is also designed with your comfort in mind. It’s got a rubber over-molded handle. The rubber mold not only makes the handle comfortable to grip, but it also minimizes vibration in the drill. One particularly nice feature of the drill is its weight — it’s just over three pounds. People who’ve given the Hitachi drill a try have been pretty impressed with it. A few called it an excellent drill, praising its ability to power through extensive projects. The chuck seems to be a feature people are pretty excited about. Many noted that it was high quality and all metal. A few pointed out that the chuck did loosen a bit as they worked, but that it was a quick fix to tighten it up again. 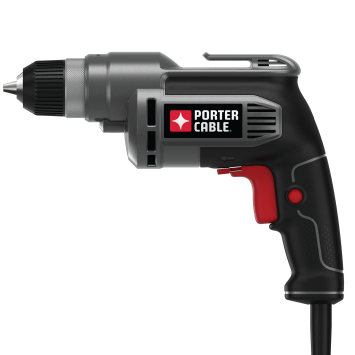 With its 6.5 am motor, the PORTER-CABLE drill is a little less powerful than our other picks but still gets the job or jobs done. It has a keyless chuck that holds up to 3/8 inch bits. Because of its motor power and design, the drill is best suited for metal or wood projects. You might want to find a more powerful drill (or even a hammer drill) for concrete or masonry drilling. One drawback about the drill is that it has a six-foot cord, which might be too short for you to use it without an extension cord. People who’ve given the drill a try have said that it worked better than they expected. A few were happy about the cord, as it meant that they don’t have to worry about batteries. A few people complained that they found it difficult to get the keyless chuck fully tight and some also noted that the drill was on the loud side. 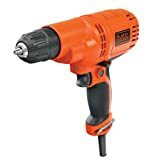 BLACK+DECKER DR260C 5.5 Amp 3/8'' Drill/Driver. If you’re looking for the best corded drill for occasional use, you might consider the Black+Decker drill/driver. It’s got a pretty weak motor (just 5.2 amps) compared to the other models in our roundup. But if you’re only using the drill to hand the occasion picture frame or to put together IKEA furniture, 5.2 amps is going to be more than enough. One particularly nice feature of the Black+Decker drill is that it has a little on-unit storage system, which holds screwdriver bits. That’s because the drill isn’t just a drill, it’s also a power screwdriver. It doesn’t come with drill bits does come with a double-sided screwdriver bit. The Black+Decker is probably the most budget-friendly corded drill in our roundup, coming in at under $25. Despite its limited features and bargain basement price, people have been pleasantly surprised by the drill. People are happy about the comfort grip handle and the overall weight and balance of the drill. A few did complain about the length of the cord, but for the most part, many agree that the corded model is a better value than a cordless one. One issue people had with the drill involved the chuck. Some noted that it was over tightened when it arrived and that it was a challenge to loosen it up to insert the drill bits. You could argue that the biggest difference between a corded and a cordless drill is the power source. A corded drill plugs into an outlet and requires electricity. 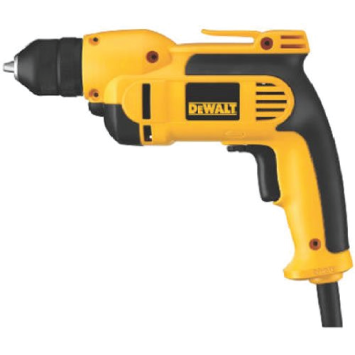 A cordless drill is powered by a battery. The drill’s power depends in part on the power of the battery. In many cases, whether a cordless drill is better than a corded drill or not comes down to personal preference. Those who are in the corded drill camp note that you never have to wait for the battery to charge and you don’t experience a loss of power as the battery dies. Those on team cordless drill note that you can use them pretty much anywhere, whether you have electrical power or not (provided the battery is fully charged). If you need a tool that you can rely on to consistently give you the same amount of power and torque, you need to go corded. Corded drills also tend to weigh less than cordless models, since they don’t have a heavy battery attached. Once you’ve decided to go with a corded drill model, what should you pay attention to? There are a few features keep an eye out for. Power. A corded drill’s power is measured in amps. The more amps the motor has, the more power you’re going to get – 8 amps is usually sufficient for home projects. Speed. Usually, a variable speed drill is going to give you more flexibility and options than a single speed drill. Chuck. The chuck is the part of the drill that holds the bits. Pay attention to the size of the chuck and whether it’s keyed or keyless. Comfort. How the drill feels in your hands matters. Look for a model with a comfort grip handle and if possible, a model with a side handle for extra support. Cord length. Unless you plan on working right next to an outlet, make sure the cord length is long enough to accommodate your needs. Bonus Features. Lights, lights and other bonuses might not be must-haves, but they can make your drill more convenient and easier to use. Ready to use a corded drill? These tips will help you get the most out of your drilling experience. Think “safety first.” Even if you’re only working on a small project, wear eye protection when using a corded drill. It’s also a good idea to wear fitted, long-sleeved clothing. Choose the right bits. Choose the bits you’ll use with the best corded drill based on the material you’re working with. For example, if you’re drilling into brick, you need to make sure you use a masonry bit. Size also matters. Start with a small hole. If you’re drilling a wide hole, such as 1/2 inch in diameter or wider, it’s a good idea to make a smaller hole first, then work your way up. It seems like more work, but it’s worth it. Secure materials, if necessary. If you’re drilling into a piece of wood or metal, it’s a good idea to clamp the material to a secure surface before you start drilling. You don’t want the wood or metal to move about as you get to work. Tighten the chuck. Once you’ve fit the drill bit into the chuck, make sure it’s fully tightened. If you’re using a drill with a keyed chuck, don’t finger tighten it — use the key to make sure it’s as tight as possible. Don’t go too fast. Slow and steady wins the race when it comes to drilling. Don’t push too hard. You also want to avoid putting too much pressure or force on the drill as you work. Which corded drill is the best corded drill? We’re going to pick the DEWALT DWD112 8.0 Amp 3/8-Inch VSR Pistol-Grip Drill with Keyless All-Metal Chuck. It can tackle pretty much any project and has a super comfortable handle. We’re also pleased with its overall weight, though it is a little front heavy.